How can poisons enter the body? A poiso n is any substance or matter (solid, liquid, or gaseous) which when applied to the body outwardly, or in any way introduced into it, can destroy life by its own inherent qualities, without acting mechanically, and irrespective of temperature. The effects of poisoning on a casualty will depend on the amount poison absorbed. Note that in small, controlled doses, some normally poisonous substances have potentially beneficial effects. eg. Atropine. 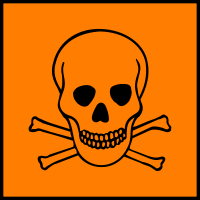 Likewise, many substances which are classed as harmless or beneficial in normal use may have poisonous effects if taken in abnormally high quantities. eg. Aspirin. The action of many poisons on the body is complex, and may have consequences beyond the initial reactions. eg. damage to organs such as the liver or kidneys by the toxic chemical action of the poison. How can posions enter the body? by being absorbed through the skin. Take precautions to avoid contamination from the poison. Summon medical assistance, or transport the casualty to a hospital. Keep the casualty calm and prevent all unnecessary movement. Do not give the casualty anything to eat or drink. Do not attempt to induce vomiting. Wash away any poison on the surface of the skin, and clean any sites of injection, using clean water. Monitor the casualty’s condition continuously, and be prepared to utilise CPR. Inform the medical services of the nature or identity of the poison – if known. Pass them a sample of the poison, or any container, if possible. If the casualty vomits, pass a sample to the medical services.